What to do with all that leftover turkey? Make this dish! :-) Over the years, I've made this dish countless times. The original came from Taste of Home, and I've cleaned it up. It's got great flavor, tons of protein, and reheats well, too! ● Preheat oven to 350. Grease 9x13 pan (I use coconut oil). ● Mix all ingredients (except the tortillas) in a bowl. ● Divide into the 12 tortillas, wrap and place seam side down in pan. 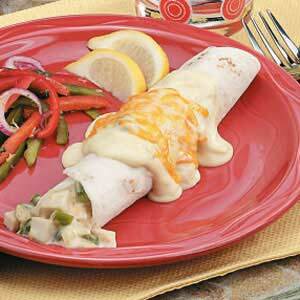 ● Mix together ingredients for the topping, then drizzle over the burritos. ● Sprinkle with a bit of cheddar if you like. ● Bake for 30 minutes, allow to cool for 10.